Stampin'Up has free shipping until April 10th! They haven't had this deal for a long time so stock up on your 2013-2015 InColor products, Occasions products and stamping basics. If placing and online order use this hostess code MRV7U997 and I'll enter your name into a draw for the hostess benefits. I have three card classes this week if you want to join in the stamping fun. I have a class on Wednesday 9:00-11:30, 12:30-2:30 and 7:00-9:00 and Friday 7:00-9:00. 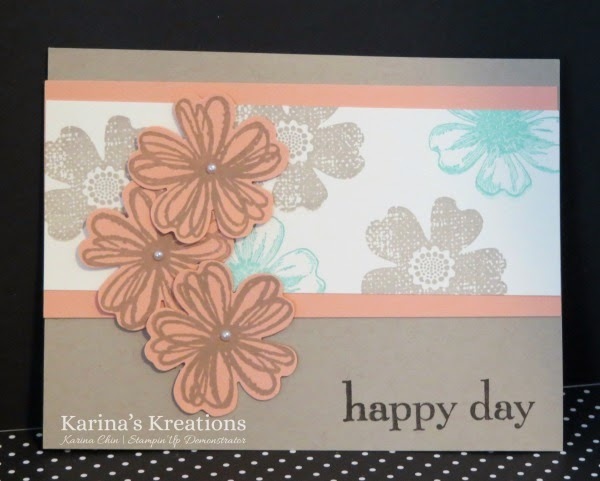 Here's the Stamp it My Way card challenge this week. Make a card with these pieces and post it here! It's my group facebook page so email me at kchin2@telus.net and I'll add you to our group. Here's the inspiration for this challenge. This is a swap from Angela Curry. She used the Flower Shop stamp set on this card.